Kanpur Development Authority invites application from public for the allotment of housing units in KDA Signature Greens. It is a new housing scheme of KDA Kanpur comprises of 1128 flats. KDA Signature Green is located at Bus Depot Marg, Kanpur. Under the scheme, the authority has offering flats in 13 storey building in which 2BHK and 3BHK flats are being constructed. The size of 2BHK flat is around 103.13 square meter while the 3BHK units is available in the size of 128.80 square meter. 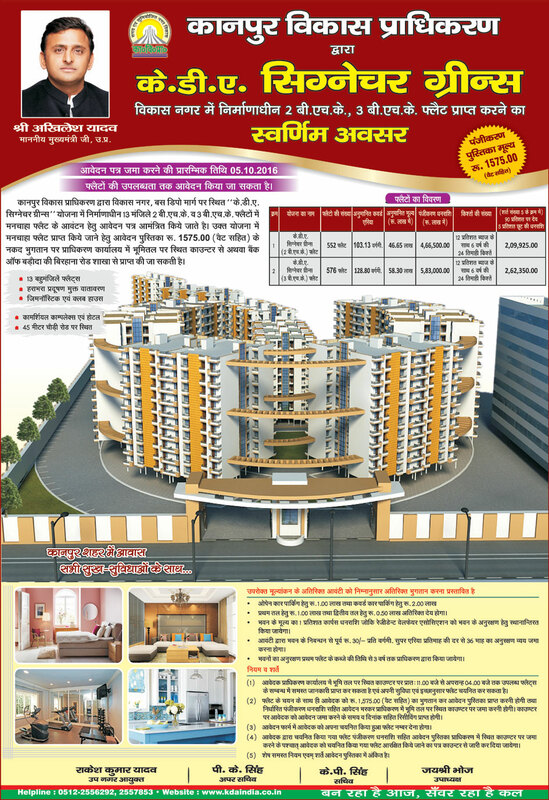 The estimated cost of 2BHK unit is Rs. 46.65 lakh and for 3BHK it is Rs. 58.30 lakh. Registration for flats in the scheme will start from 5 October 2016. In this scheme, the authority has offering a option to choose a flat. For choosing a flat, application booklet along with application form is available at the cost of Rs. 1575/- at the counter of Authority Office, Ground Floor. It can also be purchased from the Bank of Baroda branch at Birhana Road. Dully filled application form to be submitted in the same counter along with registration amount. In the application form, the applicants will also have to mention the flat number they choose. Scheme Closes: Registration will be opened till the availability of the flats.